When I was young, there was a local woman who was extremely unhappy with her husband’s late night carousing. He would come home “a bit tipsy” as well, and tried to sneak in unnoticed by leaving the lights off. She was tired of it, so she got even, er, um, I mean, created a learning moment. She rearranged all of the furniture and you had to walk through the living room to get to the bedroom. About 3AM, she heard a huge crash. Well, that’s what 23andMe did a few weeks ago. I know they think they improved their website, but they didn’t. And what they’ve done is cause a huge amount of work for those of us who assist others who have tested at 23andMe. People can’t find the genealogy tools. They both renamed them and relocated them and we didn’t even get any new features in the deal. Where features were located wasn’t intuitive before, and they still aren’t, but now they are in different unintuitive places than they were before. In other words, stumble, thump, crash – the lights are out and someone’s home. So, as a matter of self-defense, I’m writing this blog about the basics of how to navigate the 23andMe site and how to utilize their genealogy tools. It’s easy to miss opportunities if you don’t understand the nuances of their system, and they do have some great tools, by whatever name they call them. The sign-on screen still looks the same. After that, it’s all different. First, remember that if you manage multiple kits, 23andMe decides which one is your default and you may not come up as “yourself.” You can solve that by flying over your name in the upper right hand corner and then clicking on “switch profiles.” I surely wish they would let you select and save your selection permanently. You have to switch profiles every time you sign on. The second thing you need to make sure of is that you ARE sharing, that people can see you. Fly over the gear on the left hand side of the page at the top. You’ll see the Settings option, click on that, then look through the options there, but specifically the “Privacy/Consent” tab. I’ve had people who could not figure out why they never received any invitations and their friends couldn’t find them, and it’s because their selections precluded sharing or did not allow people to search for them. Here’s part of the Setting page, but you’ll want to review all of the information under your various settings tabs. If you want a quick overview of all of your genealogy information at 23andMe, you can click on the “My Ancestry Overview” button, but that’s not where the meat is – it’s more like an appetizer. You’ll see your own results in a circle chart. You can toggle the “standard” estimate to speculative or conservative in the drop down box at the upper right. You can also change this circle to “chromosome view” which is really interesting. The bar graph shows me that the two locations with identifiable Native American ancestry are found on my chromosomes 1 and 2. If you’ve been following my blog, you’ll know that I took this information and ran with it. Here’s the link to “The Autosomal Me” series. If you’re interested in taking this further and trying to identify your lines that match up with different ethnic admixtures, take a look at the series, especially Part 4, “The Autosomal Me, Testing Company Results.” You’ll need to utilize some special download techniques and tools found outside of 23andMe, such as www.dnagedcom.com and you’ll also be utilizing www.gedmatch.com as well. What 23andMe provides you in this category is just the beginning. 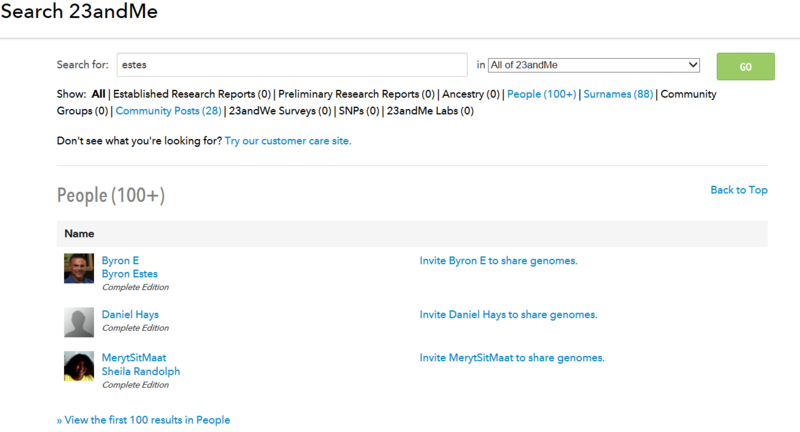 There are four ways to find and select people at 23andMe to invite to share their DNA with you. 23andMe is different than Family Tree DNA. At Family Tree DNA, you are testing FOR genealogy, nothing else, so when you sign your authorization and consent for comparison, it speaks only to genealogy data, not medical data. So everyone at Family Tree DNA is sharing unless they specifically elect not to. 23andMe also provides health information and many who tested for health traits are not interested in genealogy, so in order to share any information at 23andMe, you must invite them to share and they must agree. Of course, 23andMe shows you a thumbnail of who you match, but there are several ways to refine and be selective about this process. 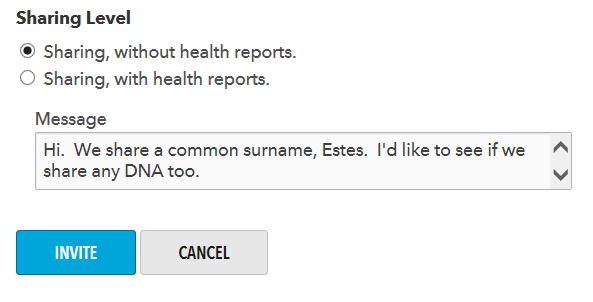 If you know who you want to invite to match, enter their e-mail address, their name, their surname or their nickname at 23andMe in the main site search box. 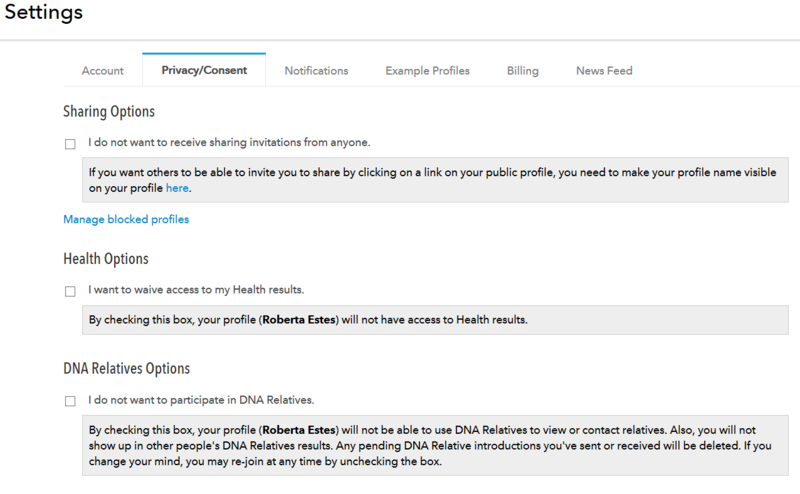 If they have allowed searching and have tested at 23andMe, a link to request sharing will be shown, similar to the screen below. First of all, to find people whose surnames include those in your family tree as well, in the general site search box, type in the surname you’re hunting for. Let’s hope it’s not Smith. The results of that search in all categories on the 23andMe site are shown, and you can click on any of the categories for more information. In my case, I see that there are more than 100 people whose information includes Estes. I can click on any of the links that say “invite so-and-so” to invite them to share with me. I always customize the message. Many people don’t reply to “generic” messages that don’t say why someone is asking to compare. 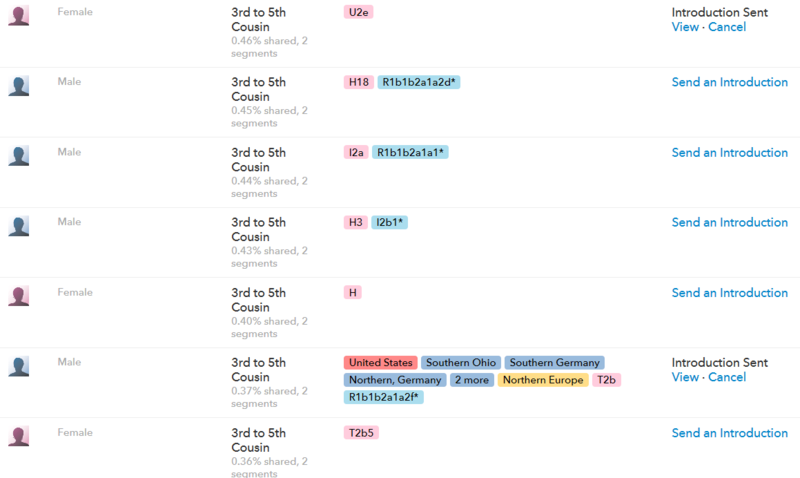 To see whose DNA you match, click on Family and Friends, then on DNA Relatives. The first person on your list, is you. This is a good sanity check to be sure you’re comparing the right profile and not your cousins when you thought it was your own. Next you’ll see your closest matches. These folks I’m most closely related to are my “Blessed Cousin Circle” who graciously provided their DNA so I could utilize it to figure how who matched whom. Like a huge family puzzle, with no picture on the box cover. On down the list a ways are folks who I match but with whom I’m not yet sharing. Geeze, guess I’d better try to fix that! Looking down the list, I see that few have included much information, which is sometimes an indication that they’re either not interested or don’t know a lot about their genealogy. But look, there’s one with quite a bit of information near the bottom of the list. Great. But wait….oh no….I’ve already sent an invitation and never heard back. That’s OK though, because I can send another message by clicking on “View” and then “Compose.” Again, I always include a personal message. Some people include links to their family trees in these messages as well. Let’s say I want to be more specific and I want to target people on my match list that have a specific surname. I want to see who among my genetic matches also shares the Bolton surname in a genealogical line. In the “search matches” box at the top of the list of names, I entered Bolton, my father’s mother’s maiden name. The list returned is small. The first person, Stacy, is my cousin and I know her genealogy quite well, so that surname match is expected. But I don’t’ know the second person, Janet, and I need to investigate this further. Remember, this is a surname search of those who match genetically. Even though Janet and I share a common surname and some DNA, our match may NOT be through the Bolton line. In fact, it could be on my mother’s side instead. So as a quick check, since I manage my Cousin Stacy’s DNA account, and she is related through my father, I’m going to see if she matches Janet too. If so, then that means the match is from my father’s line, and could well be the Bolton family. This technique is called triangulation. Stacy does not match Janet, so that means that more genealogy work is in order to see if the Henry Bolton (1759-1846) ancestral line is our common line. It could simply be that Stacy and Janet are too far removed from a common ancestor and Bolton is the correct genealogy line, but they don’t share a large enough segment of DNA to show up on each other’s lists. The other potential issue is that either Stacy or Janet is over their 1000 match limit imposed by 23andMe, so they might actually match each other, but have fallen off the match list. This is becoming a larger and larger issue. I’m over that limit as are most people who have Jewish heritage and many who carry colonial American genealogy. 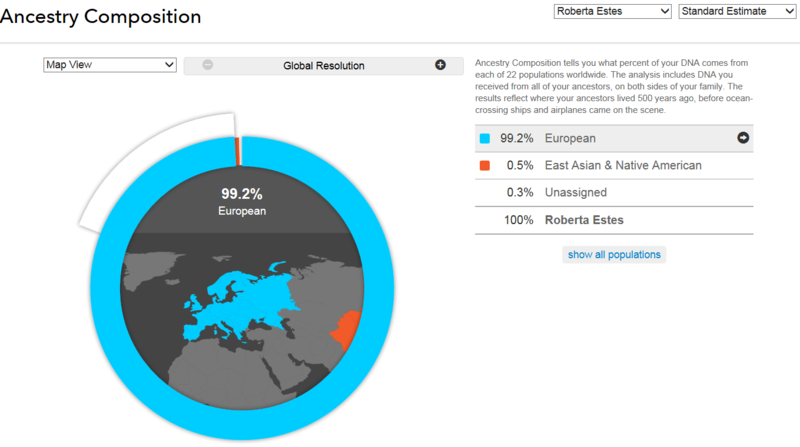 So far, 23andMe has declined to address this growing issue. It makes drawing any conclusions from this type of triangulation impossible through a vendor-imposed handicap. On the DNA Relatives Page, click on the surname link in the upper right hand corner. What this shows you are the number of the various surnames on your list as compared to how rare they are in the general population. This is your signal that something is up, so to speak, and it might be your lucky day. My most “enriched” surname is Vannoy. This means that it appears 7 times in my match list, including as one of my own historical surnames, and it’s quite rare otherwise, which is why the 98 on the enrichment bar and the fact that is it is my more prevalent rare surname. Looking down the list, this implies that maybe Henley is one of my family names that I’m not aware of. Maybe I should contact the Henley matches and see if there is anything in common between them, genealogically, and if I have any dead ends where their ancestors are located. Maybe I should see if their DNA and mine overlaps in any common location. The easiest way to do that would be to use the downloaded spreadsheet via www.dnagedcom.com because then we can see everyone who matches those segments of DNA, including those who have tested at Family Tree DNA because I’ve downloaded that file into my spreadsheet as well. You can click on the surname and your matches will be displayed, including ones you’re sharing with and ones you aren’t. In this case, I clicked on McNeil and discovered my matches are all my cousins, so nothing new to be discovered here. I did notice that not all my surnames are present. For example, Estes is missing. I’m not sure how 23andMe selects the names to include, and there is no “page help,” so I’m just glad for the ones that are present on the list. Ok, now that you’ve found matches and they are sharing with you, what’s next? 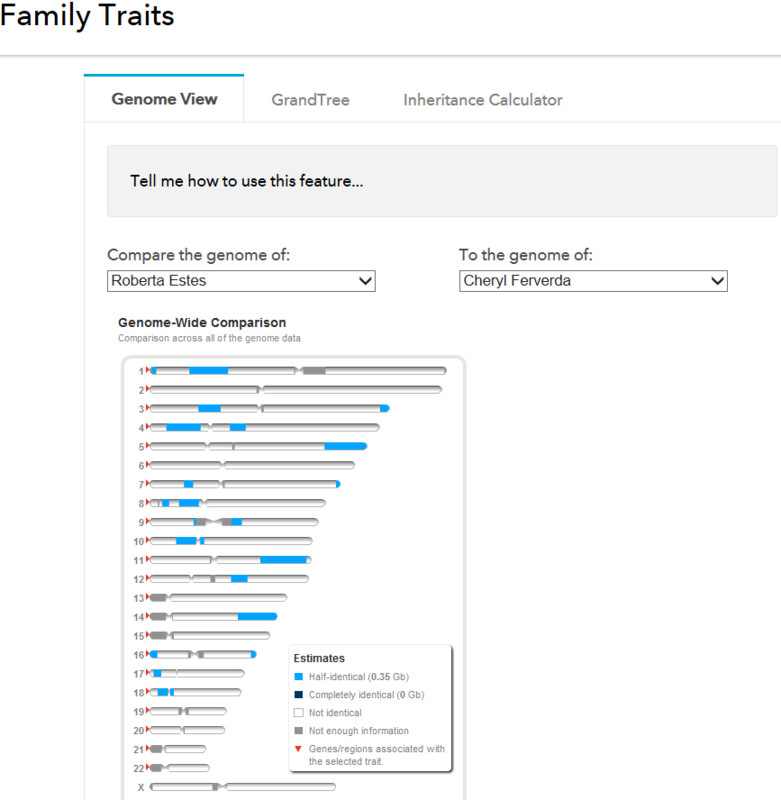 The next tool is the chromosome comparison tool, found under Family and Friends, then Family Traits. This tool allows you to compare any two people on your list of matches, including the X chromosome which is inherited differently and can be a very important genealogy hint. Here’s a comparison of me and my cousin, Cheryl. Her father and my grandfather were brothers, so we share quite a bit of DNA. And because I know where it comes from, genealogically, anyone who matches both of us on these segments shares our ancestry too. No, you can’t do that “compare all” function at 23andMe, but your downloaded spreadsheet will handle that quite nicely. Update: Venice points out that Family Traits does one thing that Family Inheritance: Advanced doesn’t do – it identifies fully identical segments vs. half identical segments. Most segments between genetic relatives are half identical, but (full) siblings will have a fair amount that’s fully identical. Family Traits also shows the locations of the centromeres and other low-data zones. 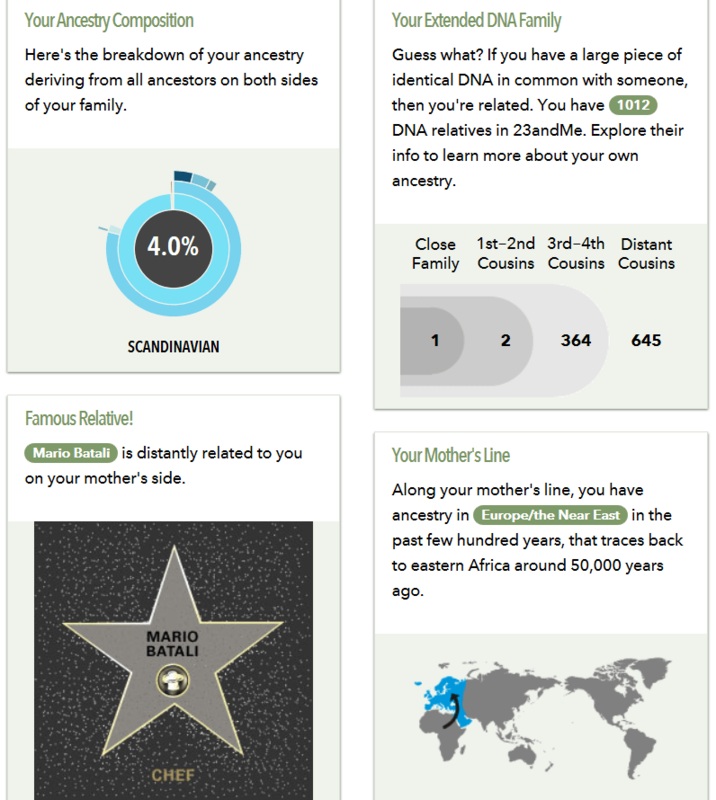 Under the Ancestry Tools tab, there is one more tool I want to discuss briefly. Unfortunately, it’s not as useful as it could be because of the way it has been implemented. Update: Kitty has found a way to allow for Public match comparisons. “To offer to share with a public person you have to click on their name at the left to go to their profile and then click the words Invite (name) to share genomes located at the top right.” Thank you Kitty! Let’s use Family Inheritance Advanced as an example of two people who match me on the same segment, but are from opposite sides of my family. I know when we talk about this, people secretly say to themselves, “yea, but how often does that really happen, I mean, what are the chances. ?” Well, here’s the answer. Better chances that winning the lottery, for sure, and I mean the scratch off tickets where you win a dollar! My cousins Stacy and Cheryl are from Dad’s and Mom’s side of the family, respectively. We know they don’t share common ancestry, but look, they both match me on four of the same segments. How is this possible, you ask. Remember, I have two halves of each chromosome, one from Mom and one from Dad. It just so happens that Cheryl and Stacy both match me on the same segment, but they are actually matching two different sides of my chromosome. Now let’s prove this to the doubting Thomas’s out there. Here is the comparison of Cheryl and Stacy directly to each other. They do have one small matching segment, 6 cM, so on the small side. But they don’t match each other on any of the segments where I match both of them. If they did match each other and me on the same locations, it would mean that we three have common ancestry. This is another example of triangulation. The fact that they match each other on one segment could also mean they have distant common ancestry, which could be from one of our common lines or a line that I don’t share with them, or it could mean they have an identical by state (IBS) segment, meaning they come from a common population someplace hundreds to thousands of years ago. The real message here is that you can never, ever, assume. We all know about assume, and if you do, it will. In this case, assuming would have been easy if you didn’t have the big picture, because both of these family lines contain Millers from Ohio living in close proximity in the 1800s. However these Miller lines have been proven not to be the same lines (via Yline testing) and therefore, any assumptions would have been incorrect, despite the suggestive location and in-common names. Furthermore, one Miller line married into my cousin Stacy’s line after our common ancestor, so is not blood related to me. But conclusions are easy to jump to, especially for excited or inexperienced genetic genealogists. It’s tempting even for those of us who are fairly seasoned now, but after you’ve been burned a few times, you do learn some modicum of restraint! Downloading your raw data is not the same thing as using www.dnagedcom.com to download your chromosome start and stop locations for your matches. Your raw data is just that, raw data. It looks like this and it’s thousands and thousands of lines long. It’s your actual values at different DNA locations. The rsid is the location on the reference human genome, followed by the chromosome number, the position address on that chromosome, and the nucleotide given to you by each of your parents. It’s doesn’t mean anything in this format, but after analyzing it using complex software, this information, combined, can tell you who you match, your ethnicity and more, of course. You’ll want to do a couple of things with your raw data file. First, use this link to download it. They’ve hidden the link well on their site. I can never find it, so I just keep this link handy. Consider uploading your raw data to www.gedmatch.com. It’s a donation site (meaning free but donations accepted) created for genetic genealogists by genetic genealogists and it has a lot more tools than any of the testing companies alone. Think of it as a genetic genealogy sandbox. One of the benefits is that people from all 3 testing companies, 23andMe, Family Tree DNA and Ancestry.com can upload their data and compare to each other. The down side is that many people don’t know about GedMatch and don’t utilize it. Then scroll down to “Third Party” and the product you’re looking for is “Transfer Relative Finder” which used to be the name of the 23andMe products before they rearranged the furniture. Happy swimming in the genetic genealogy pools. Let’s hope you meet some family there! This entry was posted in 23andMe, Admixture, Ancestry.com, Autosomal, Biogeographical Analysis (BGA), DNA Testing Companies, DNAGedcom, Education, Family Tree DNA, GedMatch, Jewish, Native American, Privacy, Security, Tools and tagged General Information by Roberta Estes. Bookmark the permalink. THANK YOU!!! This was badly needed, and will save me a huge amount of trouble trying to help new contacts navigate the site. It’s clear, complete, and fun to read – good job all around, and I greatly appreciate the time and effort you put into doing it. Is it possible to transfer data from Family Tree to 23 and me? Thank you for that information. Why would they ever implement something so convaluded? How would anyone ever know? I’ve updated the posting with that information and a link to your blog Kitty. Thank you. Very detailed article. Great job! Thank you, Roberta! This will be very helpful. I wrote to 23 about the difficulties with the new format, especially about “Older People” having trouble maneuvering through the changes. I hope that one day these young “whipper snappers” that run these companies will realize that change is not always for the best, especially if they are dealing with a lot of senior citizens. It is arrogant to think otherwise. That brings me to another problem…it’s not easy to find where to write to them. I haven’t finished reading your blog but I am totally impressed. You are my new hero. I have been here 3+ years and still struggling to remember where everything is located – and why it’s there. Perhaps they should have had some beta testing by users before they arbitrarily released a new look. Just a thought. Excellent breakdown Roberta! I was also having trouble finding tools on 23andMe so your detailed explanation with examples will be very helpful to a lot of people. This is such a meaningful article, Roberta. Thank you. I have a question that I hope will be helpful to others as well as myself. It is related to the Ancestry Composition, chromosome view. I match with over 20 other people in a region of chromosome 1. So does my mother and a maternal cousin. A handful of us have spent hundreds of hours trying to find a connection. We have large family trees, lots of combined education, and we have gotten nowhere. Some of us have similar ancestries including PA Dutch, early Scots-Irish, and English via New England colonies. We have focused on each of these categories, researching PA German Immigration records, books about the Scots-Irish in Westmoreland County, PA… just to give you an idea of the depth of our reading. Yesterday I looked at the Ancestry composition, chromosome view, and saw that neither I nor my mother are shown as having British and Irish on chromosome 1. We have plenty of British and Irish on other chromosomes and in our family tree. But French and German are showing quite a lot on chromosome 1. My question is: Should I take this seriously and abandon the search for our connection in New England and among my Scots-Irish ancestors in Westmoreland County? Should I focus on the German ancestry, which includes PA Dutch, but not exclusively? My team mates are still searching New England. 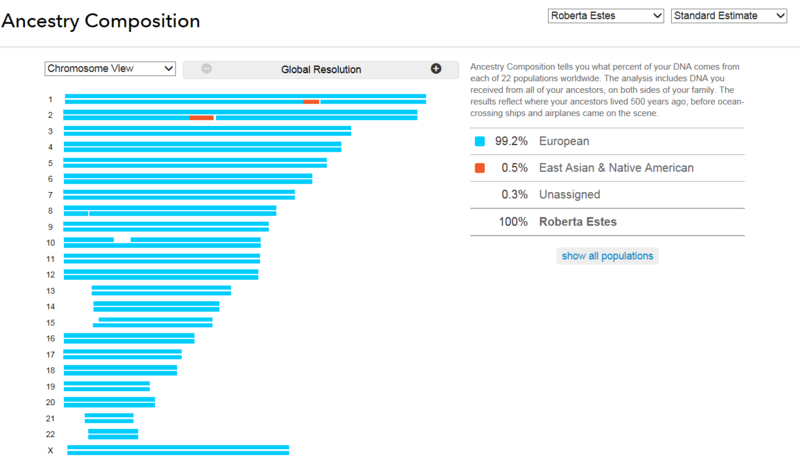 How does 23andme determine our ancestry on particular parts of particular chromosomes? Is it really based on samples from those populations? Hopefully they are not relying on the self-reports of the 23andme members. Thanks very much. Hopefully you can enlighten all of us so that we can use this feature. I suggest you send this question to 23andMe directly. My understanding is, which may not be totally correct, that the AC chromosome view IS in fact based on the information entered by their clients. However, I have never verified that and suggest that you do so before proceeding any further. I would also like to know the answer, from the horses mouth, so to speak. Also, be sure to compare these people to each other as well using the Advanced function. That should help you group them and may help you in the research project as well. Thanks, Roberta. I’ll do that and report back. Thank you Roberta for this well drafted outline for interpreting our reports. I have been totally perplexed since receiving my report and will now view it in accordance with your outline. I’m truly a newbie and need all the help I can get. 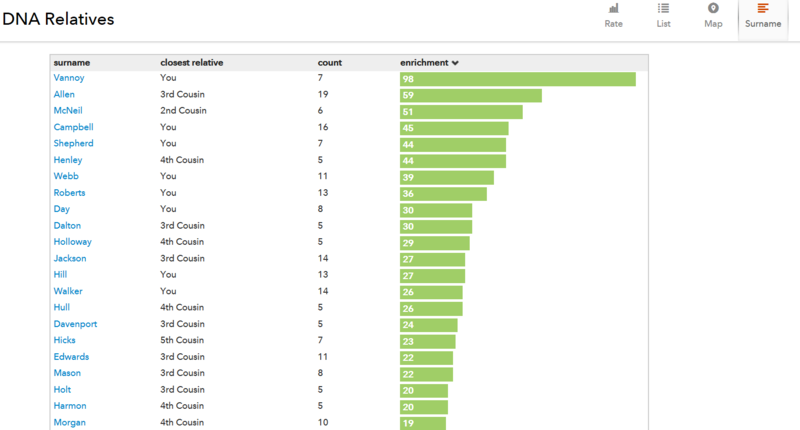 I’m surprised you prefer the Chromosome Comparison tool over Family Inheritance: Advanced. Could you maybe explain that in more detail? With FI:A you can compare any of your matches against you PLUS any two of your other matches simultaneously, instead of just one at a time. And you get start and stop points if you go to the Table view. Makes it very easy to get a sense of who to look at more closely for triangulation purposes (which has been made especially easy with the Chrome add-on 529andYou). I didn’t say that I preferred it. I was showing the different tools, that’s all. Personally, I’ve never been able to figure out why they have two when the FI:A would be just fine. Family Traits does one thing that Family Inheritance: Advanced doesn’t do – it identifies fully identical segments vs. half identical segments. Most segments between genetic relatives are half identical, but (full) siblings will have a fair amount that’s fully identical. Family Traits also shows the locations of the centromeres and other low-data zones. Good point. I added this as an update in the article. Ah, that makes sense….thanks for clarifying, Roberta! And, Venice, thanks for those two distinctions. Showing the centromeres, especially, can be a very helpful detail. Thank you, Thank You, Thank You!! I was about to give up on the 23andme website since their “update”. This posting has directed me to features I could no longer find and also introduced me to features I wasn’t previously aware of. Thank you! If I ever get my Relative Finder results, this will be so helpful. Re: ” To transfer your results to Family Tree DNA for $99, which is less than retesting, click on this link, then click on “Products.” The price dropped to $49 yesterday. I think it’s a one-week sale. The sale ends June 14th. Never mind, Roberta. 🙂 Just saw your other post. On June 8 sent an enquiry re: testing with 23andMe after reading your message and my own frustrations with their site. Since then have found their blog re: the Canadian Genome Project in which the answers to my concerns are contained. Learning, learning ….. Thank you, Bonnie Smith. Thanks for your article, this is really useful. I have a small group of potential genetic cousins, with ancestors from the same area on the border of county Mayo & county Sligo, with an uncommon name of Rochford (originally Roughneen). Most all of us have the ancestors living in the us for 3-4 generations. I’ve been using http://www.gedmatch.com with cM = 1 to find what, if any, matching segments we might have. With this, I get estimates from 3.7 generations to 6.3 (the match on 3.7 does have a paper trail which matches that estimate). I’ve seen then gone through and found all of the segments where we overlap one another. There is no smoking gun, but there are a lot of mutual overlaps. I haven’t seen any data about what are valid number of cMs to consider, and what happens when you have smaller matches. Any suggestions on further reading? It will be great if you can make a post on how someone can mine their 23andMe raw data using offline local tools. I found few tests but they are all online and I am not comfortable uploading my data anywhere. Premethese claims to keep data local but takes ages (more than 7 hours) in free mode. 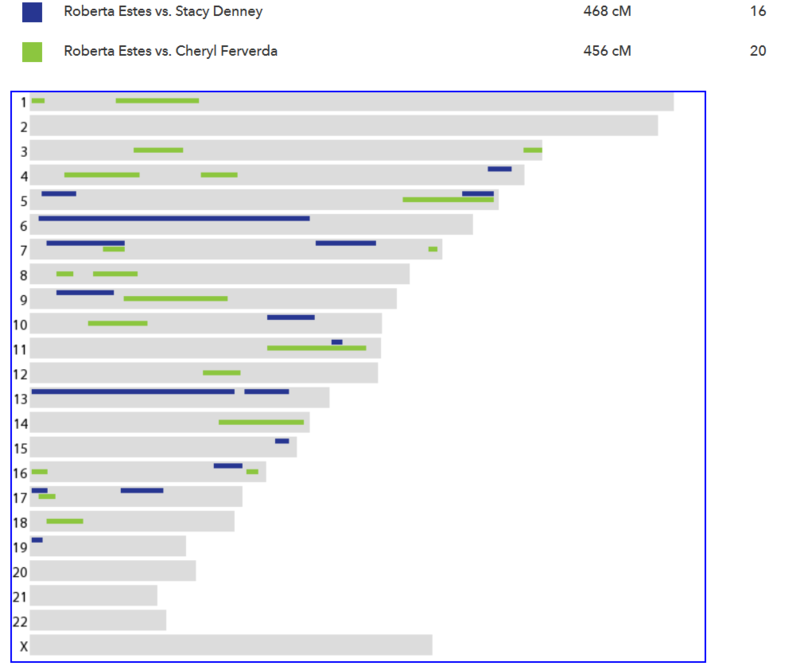 If you compare yourself to another person in Family Inheritance: Advanced and find that you share a segment with them on the top half of chromosome 6, for instance, and you’ve looked at your ancestry composition in Chromosome View, and found out that the top half of chromosome 6 is most likely from your mother’s side, are you guaranteed that the person you compared yourself to In Family Inheritance: Advanced is related to you on your mother’s side? The only way you can know if that match is on your mother’s side is if your mother has also tested, or your father, and the match is not on his side. Thanks a lot ! I think I was an idiot not to know how to navigate on 23andMe…! I don’t understand why their site is so complicated ! it’s a pity because some people stopped seeing their results as they don’t know how to manage them ! But when I want to know something I sent them a request (and there it is difficult too to find the link !). They always respond very fast. I wish I could find a website that really, really helps me understand this “triangulation” thing. I wish there was an app or a website that could do it, without cumbersome spreadsheets that are pretty geeky to try to figure out. Here’s an article I wrote. The problem with an app doing it for you it that it’s a combination of DNA AND of your and the other person’s genealogy or trees. So how is an app going to get that info from everyone involved? The definition of triangulation is 3 people matching on the same DNA segment AND having a common ancestor.